You already know that your portfolio is important, but how do you get started? Thinking of all the work you’ve created can be overwhelming if you’ve been designing for a long time. To make it easier, start with one project: either your most recent or favorite one. Maybe you have the opposite problem — whether you’re in school or switching careers — and you haven’t built up a collection of published work yet. You can still start building your portfolio by thinking about where you want to end up and creating side projects that match your goal. What should your portfolio piece include? Who is your audience? Are you looking to impress recruiters or potential clients? Is your portfolio aimed at helping peers learn from your work? What’s your goal? Are you hoping to get a new job or work with new clients? Are you trying to share what you’ve learned with peers or hoping to make a name for yourself? What’s your audience’s goal? Can they accomplish it easily? Is there anything you can do to make their experience better? With these questions in mind, you should cover each of the following within your portfolio pieces. 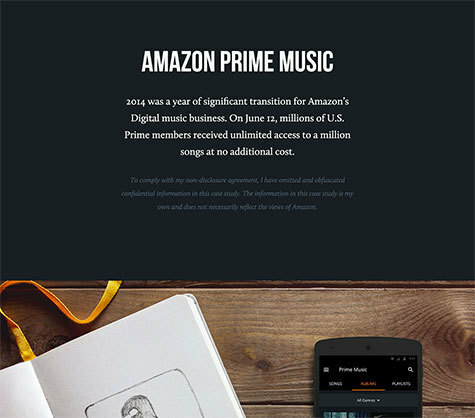 Simon Pan's portfolio page for Amazon Prime Music walks through his process and has great visuals of work in progress. The first key to a successful UX portfolio piece is the why. What problem(s) does your project solve? Everything else in your project depends on understanding that. Explain the problem as succinctly as you can — no more than a sentence or two — and build on that. For consulting projects, you should answer: Why did the client hire you to work on the project? What outcome(s) were they expecting? For products or features, you should show: What does this enable that the user couldn’t do before? How does it make their job or life easier? If you can’t clearly state the problem you are solving, this is an early indicator that this project may not be a great choice for your portfolio. Next, you need to establish how you contributed to the project. For most projects, you will probably work with a team. Collaboration can make a lot of the minor details muddy, and it’s better to be honest about how you helped a project. Did you come up with a concept or was it someone else? Did you craft the visual design, lead research sessions, write any code, or contribute any copy? Were you leading the team as a strategic visionary or down in the trenches making assets and stitching together prototypes? You can fill any or all of these roles in a UX portfolio, but you should be clear what role you filled for each project. Once you’ve defined your role, dip into the details of how you accomplished it. Were there any particular methods or tools you used that made your work easier or more effective? What parts of your process were vital to ensuring the success of the project? Walking through your process and tools can help you better evaluate what worked and what didn’t. Talking about it gives you an opportunity to show others as well, from recruiters and clients to partners and peers. Sharing these details can help others (and your future self) to succeed by learning from both your failures and successes. This portion is a great place to sprinkle in artifacts from throughout the process, whether those are sketches, flows, personas, storyboards, or fully baked prototypes. Artifacts can even include photos, particularly if your role was more strategic than generative. Think of this part as the bulk of your portfolio story. If the problem is Point A and the results (see below) are Point B, this section is the journey you took along the way. Teehan+Lax’s portfolio page for their work on Medium is a master class in creating a great portfolio. You’ve set the scene, created tension around your problem, and then told the story of your journey to the solution. Along the way, you explored some exciting adventures and lessons. Now it’s time for the resolution: was your journey successful? Did your solution solve the problem? How do you know? 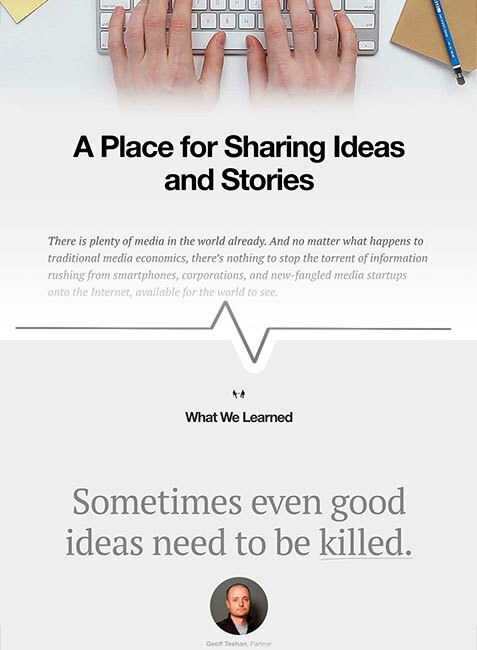 When possible, sharing specific results is the best way to wrap up a great portfolio piece. The best results point to a significant improvement as a result of the work you’ve done. This won’t always be possible, of course. You may not have a baseline to compare against to show improvements, you may not be able to share the results because of an NDA, or your project may not even have been successful. Even in these cases, you can still share your results. Think of it like a science experiment: you had a hypothesis, you set up tests to validate it, and regardless of whether your hypothesis was true, the results can help inform others and give meaningful insights to the work you did. Measured KPIs: If you have an existing product or site to measure against, improved KPIs are a quick way to show the results of your solution. Visualizations: Results speak even louder when they can be visualized, whether as a chart or graph, a before and after, or even just the smile of a satisfied user. Quotes: Speaking of satisfied users, if you don’t have access to data to validate changes to your KPIs, the next best result is qualitative responses from actual users. Your portfolio piece shouldn’t end with results. Just as each project is an opportunity to learn and grow, each portfolio piece is a chance for you to share why your project was (or wasn’t) successful, what you’ve learned, and what you might do differently next time. Honestly digging into the lessons you’ve learned in your portfolio shows your readers that you can be humble (in failure) and introspective, gives you an opportunity to teach others, and can lead to great conversations at the start of your next project. 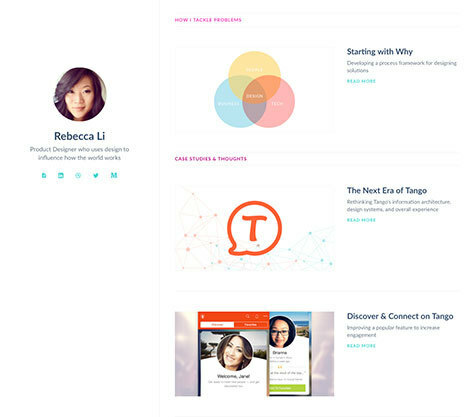 Rebecca Li’s portfolio page briefly describes each project alongside a well-selected teaser. Now that you’ve had some time to compile a portfolio piece (or more), it’s time to take a look at your collected body of work. Whether you’ve got one piece or 100, you can make it easier to explore your portfolio. Don’t overwhelm your readers. Try to stick with recent work or work that best fits what you want to be doing, and limit your portfolio to between 6 and 12 of your favorite projects. Taking the time to winnow out old or less impactful work respects your readers’ time and shows that you can make decisions. Have a trusted friend or colleague proofread your portfolio to make sure you catch all the little details. Joshua Taylor’s portfolio page has enticing teaser images. He also uses password protected pages for NDA projects. Your work is covered by an NDA. You are new to UX or still in school. Your role on projects is more strategic and less generative. Your projects are unfinished or shelved. Here are some things you can do to build a portfolio despite these potential issues. Work on a side project. They’re a great way to learn new techniques and tools, and as your own work, much easier to share. Donate your time to help a non-profit or cause. There are tons of great causes that could use design help, and most of them would be happy to let you showcase your work with them. There are a few ways to handle NDAs. You can request permission as part of your contract to share some details of the project - often the problem and your process, if not the specific solution or results. You can request permission to share a modified version of the project to obscure client details and specific solutions. Whatever you do, don’t share work that’s under NDA without having permission. There’s nothing to stop you from sharing projects that get shelved or are never finished (unless they fall under an NDA). You just may need to skip the results and focus more on your process and lessons you learned. Whether the work was published or not, you can still share the work you did and what you learned from it. 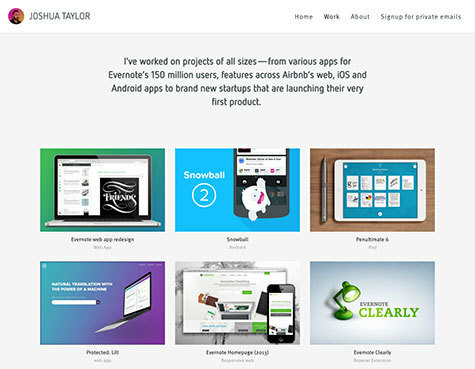 Do you have a portfolio page you’re particularly proud of? Let me know! I’m looking to compile a collection of great portfolios to share.